Despite his small size, Mattias Tedenby of Sweden earned a ranking of No. 3 among all draft-eligible European skaters. Mattias Tedenby is a small player. He’s 5-foot-8 and 158 pounds, and while he likely will put on some more weight, the height won’t change. And Tedenby, the Swedish left wing ranked third among European skaters for the 2008 NHL Entry Draft, has a message for any player who thinks he can take advantage of him. It’s that bulldog mentality that allowed Tedenby to score three goals in 23 games for HV 71 in the Swedish Elite League this past season, and his six points was third among junior-age players in the top league. 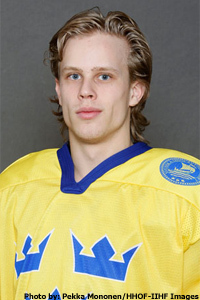 He earned his promotion to the men’s league after totaling 14 goals and 30 points in 25 games with HV 71’s junior team. “I can prove to everyone that I can play in the NHL at my size,” said Tedenby. “Look at Patrick Kane – he’s my size and he had a good year in the NHL his rookie season. Martin St. Louis is a quick forward who can score goals. Beside the chip on his shoulder, Tedenby brings great speed and balance to the ice. Those smooth hands allowed him to tie for the scoring lead with eight points (four goals) for Sweden’s entry to the Under-18 World Championships. He still needs to get stronger, which will allow him to get more force behind his shots. He also needs to work on his defensive play; he was just a plus-1 at the Under-18 tournament, and his 35 penalty minutes were a bit high for an elite offensive player. He’ll work on all those things for at least one more season with HV 71. Eventually, though, he’ll take his game to the NHL.